Lytham fighter Scott Cardle may be the unbeaten and British lightweight champion – but he now knows just how it feels to be knocked out cold! 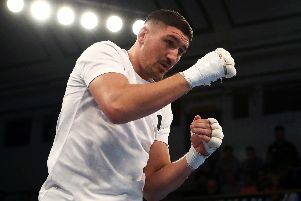 The big-hearted boxer, ably supported by his dad Joe and girlfriend Carlie Firth, endured the worst that the raw Glasgow elements could throw at them by camping out for the night at Parkhead, the home of Celtic FC and the team the Cardle family support. It was all in the name of charity and raising awareness. The commendable feat of endurance was undertaken to highlight the plight of the homeless as the triumvirate joined scores of fellow supporters camping out on the perimeter of the Celtic Park ground. Between them the trio raised £1,000 for the homeless. And they certainly earned their money thanks to their devotion above and beyond the norm. Scott admitted after eight hours’ sleeping out: “It was hard work and I couldn’t wait until it finished. “It just brought home to you what it is like for people to sleep out on the streets in all weathers. “No wonder some people freeze to death outdoors. “I had a lot of layers and still felt cold. And there was another ancillary reason why Scott could not get to sleep beneath the stars. He joked: “I could hear my dad snoring. I don’t think I was the only person who was being kept awake by that! A spokesman for the Celtic Foundation, who arranged the event, said: “We would like to thank each and every participant for their phenomenal efforts and all those who supported them along the way. “You have made a genuine difference to the lives of the most vulnerable in our community.